BIRDSVILLE TO MT.DARE FUEL denotes where fuel is availableIn more detail, I am putting down on paper my report of the Loose Nuts Simpson Desert trip. Our journey before the crossing commenced from Mildura FUEL from where we went out to show the ones who hadn’t been out there , Mungo National Park. We spent about two hours there before heading off to Kinchega National Park , our destination for that night was the Kinchega woolshed , about 18 kms SWW of Menindee FUEL, we got in a little late so the proposed roast dinner didn’t happen- a thing to remember is that you have to be versatile and flexible. It was here that we had our first medical case, a new chum to our group, had an extreme asthma attack in which we had to get outside help, even though one of our party was an anaesthetist it was off concern.All was well, so we set off the next day to Tibbooburra via Broken Hill, FUEL and further up Packsaddle, it was at Packsaddle that we had our first vehicle drama, which should not have been the case) FUEL. When we had all stopped at the pack saddle road house, there was the distinct smell of hot oil abounding. We all ducked under our vehicles and checked everything.Our medical case from the previous night had oil leaking out of the seal of the pinion gear of his diff, sympathetic at this stage we got in and helped to see what we could do to rectify the situation. Our sympathy was short lived as we discovered that the vehicle in question had only been purchased by the owner a fortnight before the trip and although he had put on new suspension and a new set of tyres for the trip – he omitted to having the car serviced and the rest of it checked over mechanically as everyone was asked to do – we couldn’t shift the diff filler plug to check the oil level, it was frozen solid, that’s when our new chum admitted that a service and vehicle check had not been carried out, his reasoning was that the previous owner told him that it had not long been serviced. It doesn’t take much imagination to figure what I was thinking.Another vehicle stayed behind with him, an old bushy welded a wheel nut onto the nub of the diff plug , we carried on with our journey more than ropable .About an hour later they caught up with us at our camp out of Tibbooburra ( GPS 29 . 25’ 45” S, 142.00’43’’ E ) FUEL. this wasn’t the last issue with this moron, but I wont bore you with the rest of this saga,only suffice to say he will not becoming on any more trips with our crew, we tend to suffer fools poorly- he could have put the whole party at risk out there beyond the horizon- people die out there Our next destination was Cameron’s Corner ( GPS 28.59’51” S, 141 . 00’01” E ) FUEL. It is certainly solitary existence out here , we continued on to our next destination , passing points of interest as the Yellow Bus ((GPS. 28. 59’42” S, 140. 30’29” E ), from there onto Merty Merty where you keep left at the junction go across the river bed and continue on till you come to a T intersection (GPS 28.33’47” S , 140. 11’16” E ). it was then to our nights destination Birdsville (GPS 25.53’52”S, 139.20’54”E) . FUEL Now our trip had really begun- next day it was the Simpson, unfortunately the section over Big Red (GPS 25.52’42”S.139.03’19”E )was closed as a lot of vehicles had come through damaged, so we skirted around to the lesser dune to the south it was only 30 meters tall, we quickly learnt the skill of dune driving , over the first, we had only 1099 to go. We spent the first night not all that far west of Poeppels Corner (GPS 25.59’44”S.138.00’02”E ) , the second night about an hours travel from Purni Bore (GPS 26.17’01”S.136.05.59”E ). The next day we drove to Dalhousie Springs (26.25’16”S.135.30’16”E) and then onto to Mt. Dare (GPS 26.04’08”S. ), FUEL, upon reflection , we should have stayed at, it was magic there, the thermal pool was fantastic, spent about two hours bathing in it, we were slightly manky after three days in the desert. The trip across the Simpson was fantastic, the skies were a picture book blue, not a wisp of a cloud anywhere offset by the red sand. The stars at night were incredible, made you feel really insignificant and at the same time privileged to be a witness to the grandeur of it all. That concludes my description of our trip across the Simpson. Our trip from here would take in the Oodnadatta Track which follows the old Ghan line most of the way, the track was in very good condition as it had been graded a fortnight before and presented no real challenge at all but we heard of incidents when it is not in good order, quite a different story apparently. Our journey back to reality took us through Oodnadatta FUEL Which was a bit of an eyesore, good to see in your rear vision, William Creek FUEL, Marree FUEL, Leigh Creek FUEL, Parachilna where we turned left towards Blinman in the Flinders Ranges, this is all two wheel driving. The only time we did any 4WD driving is when we went on the SKYTREK self drive Tour at Willow Springs which I thoroughly recommend, incredible country . After Flinders Ranges, we dawdled on our way back, Hawker FUEL then on down to the Clare valley via Burra FUEL which is a great little town worthy of spending some time there . The Clare valley is great, a great chance to stock up supplies at home, but there so many wineries and so little time. We saw camel tracks, Dingo tracks( heard them at night too ) and unfortunately wild cat tracks which are having a devastating effect on the wild life out there . A word about Dingos, it is important that you put everything away inside your vehicle and keep all doors and windows shut at night that you have touched or worn as they love to make off with anything that has human scent on it, if you think it might be a good idea to give any footwear an airing on the roof of the vehicle over night ,odds on they wont be there in the morning. Words seem so repetitive in describing it, it’s harshness is its beauty, you really have to experience it to appreciate it. We are very fortunate to enjoy such expeditions as this in this country. When you consider America , where one of their Mecca’s or holy grail of 4WD driving , the Rubicon trail where 3000 vehicles are reportedly travel on it in a week, Yosemite National park averages 10,000 visitors a week, 2,500 per day is the usual, we came across only 20 vehicles on the Simpson, are we the lucky country or not ? I have put down what is of importance if you are intending to do such a trip, read on if that is so . ROAD CLOSURE NOTICES Ignore these at your peril, financially or otherwise, if you are caught out on a closed road it is a $1000.oo fine per wheel, so if you are following the acceptable practice of carrying 2 spares, then that would be $6000.oo sunshine, These are tracks and roads that people living out here depend upon for their livelihood , and the upkeep spent on them is very frugal indeed by the relevant state governments. TRAVELLING IN THE OUTBACK Carry plenty of water (2-3 litres/person/day), food and fuel (allowing for 30-50% extra for sandy areas) plus enough food and water for an additional week just in case. You must plan to be totally self-sufficient when venturing away from towns. Avoid travelling during or just after wet weather as dirt roads will quickly become impassable and can take weeks to dry out. Driving on wet unsealed roads causes damage which takes thousands of dollars to fix. Check with local authorities on road closures and road conditions or you could be facing a large fine. Make sure your vehicle is in first class mechanical condition and carry a good kit of tools, essential spare parts (hoses and belts), two spare tyres and a tyre repair kit. Know how to check your vehicle over and make basic repairs. Learn how to bush weld using two car batteries in series. Don\'t drive at dawn, dusk or night because this is when stock and wildlife are most active. Take everything you brought in, out. Don\'t bury rubbish because it may not stay buried. Don\'t use cleaning agents or other pollutants in or near waterways or water stores and make sure your toilet is as far away as possible. SUN PROTECTION Travellers should always wear a wide-brimmed hat, long-sleeved shirt, sunglasses and at least an SPF 15+ sunscreen when outdoors and drink plenty of water (at least two litres each day). LOST OR BROKEN DOWN Do not leave your vehicle under any circumstances - a missing vehicle is easier to locate than missing people. Economise on water if not on a main road. If planning to leave the main roads, let someone know the estimated time of your arrival at the destination. ROAD TRAINS These are large trucks that can measure up to 50 metres in length with four trailers and are common on Northern Territory roads. Always give them plenty of room and if overtaking, allow at least one kilometre of clear road ahead, taking care not to drive onto the gravel. 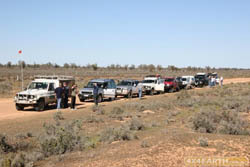 AFTER DARK Avoid driving after dark as cattle and wildlife often congregate alongside outback highways at night. Be aware that rental car insurance is void for accidents after dark, outside of built-up areas. FLOODS Do not attempt to cross flooded bridges or causeways unless absolutely sure of the depth and any road damage. Most flash floods recede within 24 hours. SAND DRIVING · Speed and flotation are the keys to success. High ratio is best, if possible. · Lower the tyre pressure to 140kpa or 20psi. You may need to go lower (lower tyre pressure = lower speed). Remember to reinflate your tyres as soon as you\'re back on hard ground. · Stick to any existing wheel tracks - it\'s a lot easier. · Avoid sudden changes in direction or acceleration. Coast to a stop if at all possible. · Tackle dunes head on. · Avoid braking at all costs when descending a dune, Keep the nose of the vehicle pointing downhill. Don\'t go fast, but not so slow that the wheels stop rolling, or the vehicle begins to slide sideways. A touch on the throttle will keep the wheels moving and the vehicle pointing in the right direction. · If you get stuck, try and rock the vehicle backwards or forwards, building up a small stretch of hardpack sand that you can accelerate off from. Don\'t spin the wheels! · Have your recovery gear handy. THE FIRST AID KIT · Basic first aid manual (from Red Cross or St John Ambulance) · Antiseptic fluid (Betadine, Dettol or similar) · Antiseptic cream (Betadine or similar) · Panadol · Eye drops · Assorted bandaids, strips/spots, wound closures · Elastic or crepe bandages (for sprains and snake bite) · Sterile gauze bandages (50 mm & 75 mm) · Triangular bandages (to support limbs and hold dressings in place) · Adhesive tape, cotton wool, tissues · Scissors, safety pins · Thermometer · Calamine lotion, Stingose or similar · Pencil and note pad. · To that you can add many items: · Antihistamine tablets · Itch/skin relief cream (for itch, bites, minor burns) · Anti-diarrhoea tablets (or mixture) · Gastrolyte - for treatment of diarrhoea · Travel sickness tablets · Andrews tablets, or similar, for indigestion · Ear drops · Temporary tooth filling mix to replace fillings, loose caps · Nyal toothache drops · Burn cream · Cream/ointment for bruises and swelling due to injury · Strepsils or similar · Tweezers, splinter remover · Rubber pointed eye probe, eye wash · Methylated spirits · "Airsplint" (for any broken limbs) · Plus any personal medication or tablets you or your family are on. AUXILIARY BATTERY SYSTEM PROBLEMS According to a leading manufacturer of multiple battery control systems, premature battery failure is on the increase, "BUT DON’T BLAME THE BATTERY. The major cause of auxiliary battery failure is excessive sulphation.Sulphation builds up on the battery plates during the discharge cycle of the auxiliary battery and is broken down by the alternator applied voltage and current, when the battery is recharged. Continuous discharging of the auxiliary battery below 11 volts may shorten the life of the auxiliary battery by as much as 20%. ""Auxiliary accessory equipment, ie fridge etc are not to discharge the auxiliary battery below 11 volts" .Not only is the battery life affected, but the time required by the alternator to recharge the auxiliary battery is longer and in some situations with late model 4WDs (direct sense alternator regulator charge systems), may not recharge at all, as the alternator regulator will sense the over discharged auxiliary battery as a fully recharged auxiliary battery. "Winches can cause problems too"Alternators on late model 4x4s are not designed to support the high winch currents and may cause excessive over-heating of the alternator. Damage caused by alternator overloads due to accessory equipment is not covered by the vehicle warranty.If the winch is connected to the main battery and the winch is turned off, high voltage spikes are discharged throughout the vehicle’s electrical circuits and could damage sensitive computer circuits in the vehicle.Recommend fitting an auxiliary battery, to connect and operate the winch. Also install a charge / isolator to charge the auxiliary batter. The charge / isolator design includes Assisted Alternator Protection, to isolate the auxiliary battery and the winch from the alternator and the vehicle electrical circuits, when the winch is operated. The alternator will be protected from the winch current overloads. "Solenoids may be cheap, but they do not provide assisted alternator protection and they in themselves, unless suppressed, introduce high voltage spikes when turned off. "Solenoids also introduced voltage drop reducing the ability of the auxiliary battery to fully recharge.The charge / isolator design ensures the high voltage spikes from the winch are reduced to a safe level and isolated from the vehicle electrical circuits, before the alternator is reconnected to the auxiliary battery for recharging. You may wish to bear the following in mind in your preparations: The desert can be very hot in the daytime and very cold at night. These are some of the milder months in Central Australia. You will need to have warm clothing for use in the evenings and for camping - temperatures can drop below zero. You will need to be judicious in what you bring. All gear has to fit into 4WD vehicles alongside camping and cooking equipment, food including limited refrigeration, repair gear, Vehicle spare and, depending on the trip and vehicle, around 100 litres of additional fuel and several 20 litre containers of water. Apart from sleeping bag and tent, consider bringing on your journey about the same amount as you would for hand luggage if you were travelling on an aeroplane - what will fit in one sturdy, dustproof, flexible bag Remember space is limited to what your vehicle can carry and you will not be meeting The Queen. · A sleeping bag rated to -2degrees and pillow? TRAVELLING IN THE OUTBACK Carry plenty of water (2-3 litres/person/day), food and fuel (allowing for 30-50% extra for sandy areas) plus enough food and water for an additional week just in case. You must plan to be totally self-sufficient when venturing away from towns. Avoid travelling during or just after wet weather as dirt roads will quickly become impassable and can take weeks to dry out. Driving on wet unsealed roads causes damage which takes thousands of dollars to fix. Check with local authorities on road closures and road conditions or you could be facing a large fine. Make sure your vehicle is in first class mechanical condition and carry a good kit of tools, essential spare parts (hoses and belts), two spare tyres and a tyre repair kit. Know how to check your vehicle over and make basic repairs. Learn how to bush weld using two car batteries in series. Don\'t drive at dawn, dusk or night because this is when stock and wildlife are most active. Take everything you brought in, out. Don\'t bury rubbish because it may not stay buried. Don\'t use cleaning agents or other pollutants in or near waterways or water stores and make sure your toilet is as far away as possible. Respect the rights of Aboriginals, pastoralists and other landholders. Though a road or track may be marked on the map, it doesn\'t mean you have automatic access. Obtain the necessary permits and contact pastoralists prior to your trip or as soon as you enter their property. Leave gates, bores, windmills and tanks as you find them. Summer temperatures can be scorching and even midday in winter can be hot enough. Always drink plenty of water and wear a hat and sunscreen to avoid dehydration and sunburn. In the event of a breakdown, stay with your vehicle. A vehicle is easier to find than a person and can offer more shelter than the desert scrub. Do an accredited first aid course and carry a comprehensive first aid kit which is easy to access. Learn some survival skills such as how to contact the RFDS and police using your radio, bush navigation, and collecting water. Driving on rough roads makes you especially vulnerable to driver fatigue. Take regular breaks and swap drivers a couple of times a day if possible. It\'s imperative that you have a backup system involving a person at "home base" who you regularly contact and advise of your travel plans. Give them a map of the area where you are going and a phone number list and instructions as to what to do and who to contact if you stop calling. Constantly be aware of where you are. Don\'t always rely on a GPS to tell you your position. A simple power failure shouldn\'t be the difference between knowing your position and being absolutely lost.The list of spare parts you choose to take on a trip will depend on your assessment of risk vs packing space. Start by checking your vehicle service manual (sometimes difficult to obtain if you\'ve purchased second-hand but worth the expense) and look at every spare item listed.